Welcome to Preview Day 1 of C.C. Designs DECEMBER release. This month's CCD release is all about Donuts and Kittens. We have a lot of new images, awesome outline dies and die set. For my dt project I made a card featuring Kittens from Meowy clear stamp set. No need to say that I absolutely LOVE them. You can also buy outline dies for these. I really like using outline dies, because the edges of the cut are a bit embossed/rounded and that looks perfect! Sentiment "Are you kitten me?" is also from the same set. I cut out the centre image with one of the new Shapers #2 die. They are awesome!!!! Papers used are from Pion. Today I'm sharing a Christmas tag made with Tilda with Holiday sweater from Magnolia's Aspen Holidays collection, 2016. Tag was cut out using Silhouette cameo. Papers used on this tag are from Maja Design, one of the older Christmas collections. I used a few different dies on this tag. Bow is from Magnolia, snowflakes and flowers are from la-la land crafts and rectangle die is from CC Designs. Today I'm showing you a few cards I made for Paper Nest Dolls show stand. These cards took forever to get to US and now that they arrived I can show them to you too. You can get the rubber stamps HERE and all the digis HERE. Today I'm sharing with you a Birthday card made with For you Tilda from Lost and Found collection, 2014. I can't believe this stamp is from 2014, it feels like she was released a few months ago. The shape of the card was made with a die from PopUp box. Dies used on this card are from: la-la land crafts, Magnolia, C.C. Designs. Papers used are from Maja design and there's also a few different Chipboard shapes from Scrapiniec. I only added 3 flowers this time, carnations and cherry blossom, all from I am roses. Today I'm sharing with you a Christmas shaker card that I made before leaving to US in the beggining of November. I used Holly Wreath Tilda from the latest Aspen Holidays collection, 2016. I also used the latest Maja Design collection, I Wish, 2016. Shaker part was filled with fine glitter (Clear rock candy glitter - Ranger), Little hearts (die cutting leftovers) and little silver hearts. Dies used on this card are from C.C. 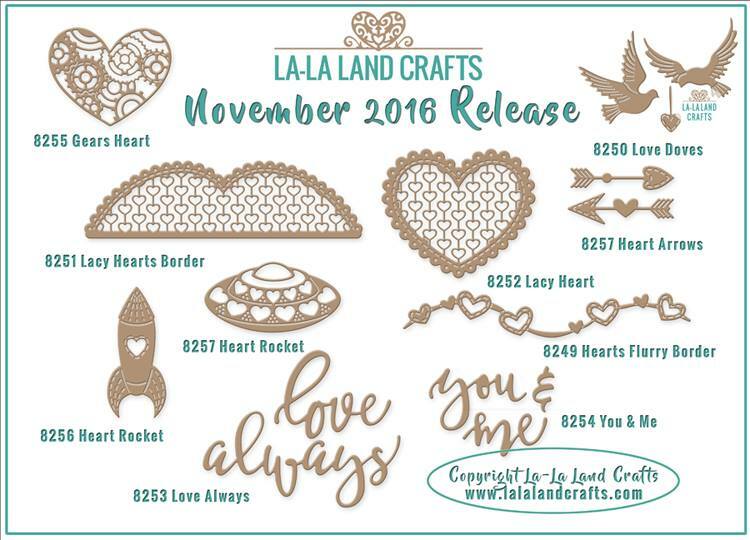 Designs and la-la land crafts. Flowers used are from I am roses! For this month's challenge project I made a Christmas card with an old Magnolia stamp. Image was coloured using Distress markers and ink pads. Papers are from Maja Design. Dies used on this card are from different companies: CC Designs, Cherry Lynn, Magnolia. 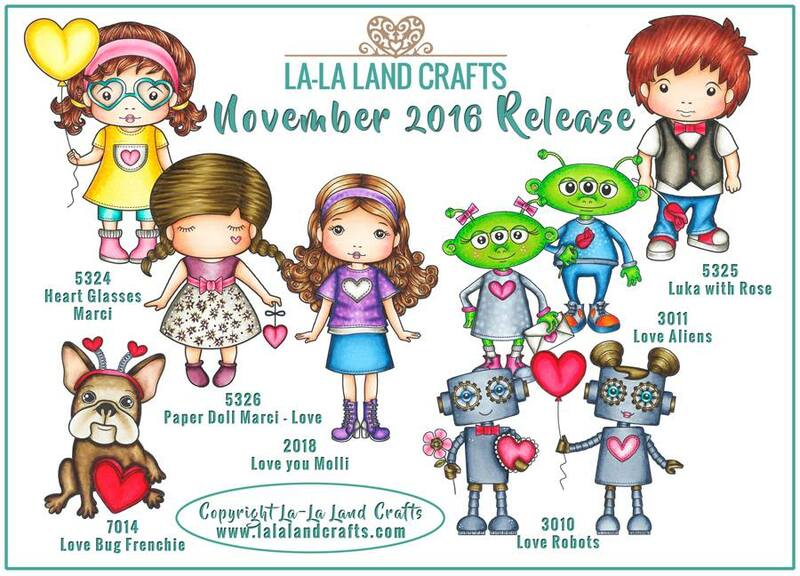 I made this project for la-la land crafts retreat 2016. 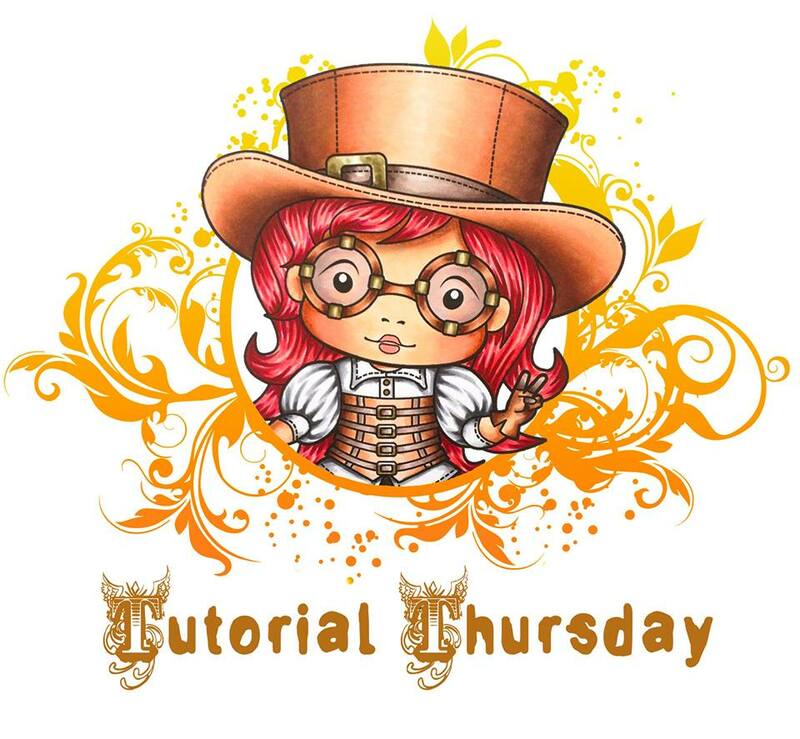 If you want to know how to make it, there's a tutorial on my blog, published yesterday. 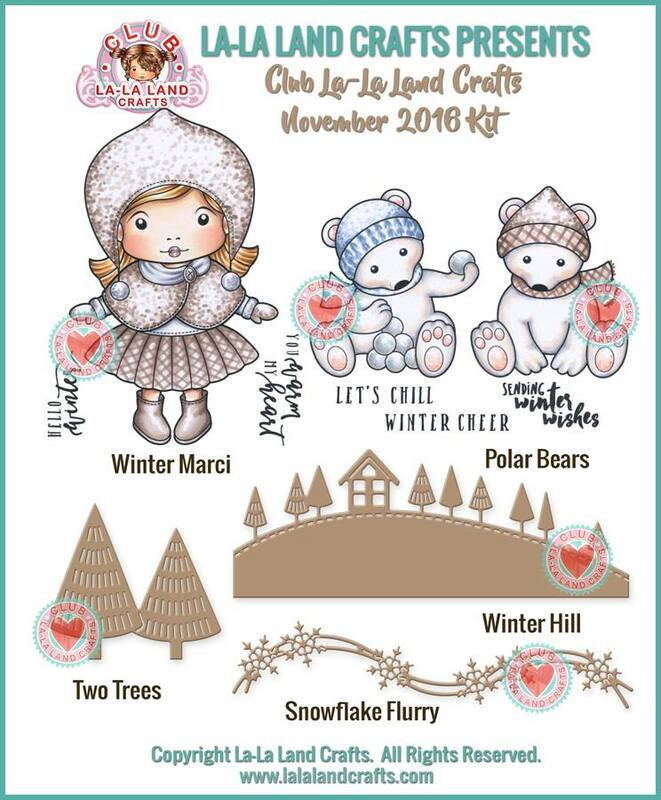 For this project I coloured two cute penguins from Winter fun stamp set. Today I'm sharing with you a card made with Snowman with Suirrels. Image was coloured using Distress ink pads and Spectrum aqua markers. Today I'm sharing with you a tutorial on how to make a small Winter box. The idea is not originaly mine, I got it here, but I did make a few changes and most of all, I used la-la land crafts stamps and dies to decorate it. Take a 2" high and 3 2/8" wide tube. The tube can be from duck tape or from any other tape. I got mine from the post office. You can buy very long tubes for sending large rolled stuff. I took it to the carpenter and he cut these for me. You can easily cut it with a crafting knife. Make two marks on the top of the tube which should be 2" apart and cut down with scissors. You get 2x2" big piece of the tube. Cut two piecec of cardstock, one 2" x 12" and the other one 2" x 5". I used I love winter design paper from Echo park. Apply adhesive on the back. Carefuly adhere the smaller piece of the tube to the smaller piece of the design paper. Adhere it to the middle of it and then fold both pieces to the inside, so that it gets covered all arround. Do the same with the bigger piece of the tube. Cut 5 2/8" x 6" rectangle from kraft paper and score at 1 3/4" and 3.5" (the shorter side). Then turn the paper arround and score at 1 3/4 and 4 1/4". Cut like on the picture. Apply strong adhesive on all flaps and on the front of the drawer. Adhere the squares and rectangles cut from design paper to the inside and to the outside. Before you adhere the smaller squares on the inside you have to adhere the flaps first!!!!! Make a hole in the centre of the smaller tube piece and to the front side of the drawer (the one with adhesive). Take the smallest die from Pierced scalloped circles and cut it out from kraft paper. Make a hole in the middle. Place the drawer handle through the die cut, tube and drawer. Make die cuts from kraft paper and design paper. Stamp the sentiment on a small piece of white cardstock. 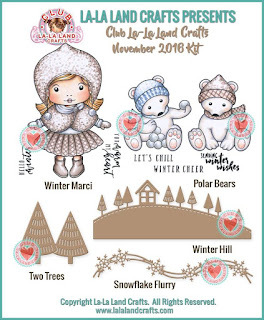 Stamp the image, colour it up and then die cut it with stitched circles die. Adhere striped circles to pierced scalloped circles. Take strong liquid adhesive and apply it to the top and bottom edge of the bigger piece of the tube. Start with bottom first and then place the pierced scalloped circle on. When dried do the same with the bottom (stripes must face up on both). Decorate the top. At the end apply some white crackle paint to the edges and glitter to the scarf.